The Haridasas have played a very important role in the history, literature and socio-economic development of Karnataka. The credit for formalising the Haridasa movement goes to Vyasa Raja or Vyara Raya (1447-1539) who founded the Vyasa Koota and Dasa Koota. While the Dasa Koota was represented by Purandara, Kanaka and others, the Vyasa Koota was given a solid foundation by Vyasa himself, Vadiraja, Vijendra Theertha and others. Vyasa Raja also played an important role in shaping the future of Vijayanagar dynasty and he was the Raja Guru of six Vijayanagar Emperors, including Krishna Deva Raya (1509-1530). However, the first Madhwa seer to write Dasa sahitya or Devaranamas was Narahari Theertha and he was followed by Sripadaraja (1404-1502) of Mulabagal. After the destruction of the Vijayanagar Empire in 1565, the dasa sahitya fell into decline and it was left to Raghavendra Swamy of Mantralaya to give it a further impetus. The second renaissance of Dasa sahitya was under this Mantralaya guru and he was an inspiration to an entire school of Dasas, including Vijaya Dasa, Gopala Dasa, Jagannatha Dasa, Prasanna Venkata Dasa, Guru Jagannatha Dasa of Kosigi and others. If Vijayanagar laid the foundation for the Dasa Sahitya, Raichur heralded the second renaissance of Dasa Sahitya as more than two hundred dasas began pouring their hearts out in devotion to Hari. The Dasas were generally staunch Madhwas and they believed in the philosophy of Madhwacharya or Dwaitism. To them, Hari was the supreme God and Madhwacharya the supreme spiritual teacher. To them, Madhwa was the third and final incarnation of the Hanuma-Bheema and Madhwa avatars and Raghavendra Swamy was the final avatar of Prahalada, Bahlika Rakja, Vyasa Raja avatar. The Dasas also believed in the concept of Taratamya or gradation of Gods which was first elucidated by Madhwacharya and subsequently by Jayatheerta or Teekacharya, Sripadaraja, Vyasa Raja, Vadiraja, Raghavendra Swamy and all other Madhwa saints and Haridasas. Interestingly, the avatars of Vyasa Raja and Raghavendra in different centuries were responsible for the growth and revival of Dasa Sahitya. If Vyasa Raja founded the Dasa Koota in Hampi or Vijayanagar, Raghavendra Swamy gave it a new direction from Mantralaya. During and after the period of Raghavendra Swamy, the center of Dasa Sahitya shifted from Hampi to Raichur-Lingasugur-Manvi-belt and over three hundred Haridasas poured out their love, affection, respect and faith to Rayaru. Today, Dasa sahitya forms an important genre of Kannada literature and it has its own identity and importance much like the Vachana Sahitya. The Dasa Sahitya influenced literature in Andhra Pradesh, Tamil Nadu and Maharashtra too. The three Dwaitha saints- Sripadaraja, Vyaasaraja and Vadiraja -are collectively called yathi trayaru- three great saints of the Dasa movement just as Purandara Dasa, Kanaka Dasa and Vijaya Dasa form the the great Dasa trinity. There are several hundred dasas and it is impossible to write about each of them. Hence, we have selected from this vast field and given a thumbnail sketch of some of them. The compositions and lyrics of the Dasas will be updated individually and at a later date. We have decided to start with Madhwacharya for several reasons. It is Madhwacharya’s composition, the Dwadesha Stotra, that led to an outpouring of faith and devotion from the Haridasas. The second reason is that all the Haridasas have believed in the concept of Dwaitha preached by Madhwacharya and they have closely followed the teachings of Madhwacharya. The third reason is that it was Madhwacharya who was solely responsible for giving a firm foundation for Vaishnava thought and philosophy and this was subsequently strengthened by scores of Madhwa seers and pandits. Hence, we have decided to commence the post on Haridasas by paying our tribute to Madhwacharya. The post on Haridasas will be serialised and it is being included in the blog on Raghavendra Swamy as all the Dasas starting with Vijaya Dasa have composed innumerable songs on Rayaru and on Mantralaya. Moreover, Rayaru, in his previous avatar as Vyasa Raja, was solely responsible for the growth and development of the Dasa Koota. So here goes the post on Haridasas. Madhwacharya or the Achraya can be said to have laid the foundation for the Dasa Sahitya when he wrote the Dwadesha Stotra which became an inspiration for scores of Madhwa saints and Haridasa to compose innumerable devaranamas on the glory of Hari and the tenets propagated by the Acharya. The Acharya was a Sanskrit scholar, an excellent debater and a saint philosopher. His interpretation of the Vedas and other shastra is even to this day unparalled. One of the four direct disciples of Madhwacharya and infact the second. The other three are: Padmanabha Theertha, the first, Madhava Theertha the third and Akshobya Theertha the fourth. He is generally regarded as the first Madhwa saint to compose Devaranamas in Kannada, including “Hariye Idu Sariye”. This is said to be the first devaranama in Kannada but it is not available now. He was earlier known as Shyama Shastry and he was a minister in Kalinga state. 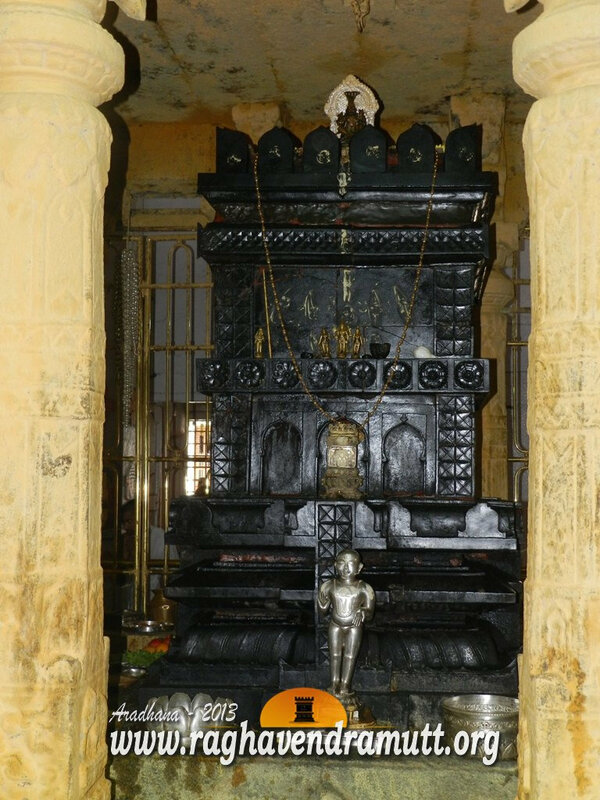 His Brindavana is in Chakratheerta in Hampi and near Nava Brindavana. He was the head of the Madhwa matha till 1333. After him, there is almost a gap of a century, before Haridasa Sahitya takes wings again.